To the front of the property, the lawned area is surrounded by a mature hedge and low wall, providing a quiet area away from the pool terrace to sunbathe, to read or chill out with a drink and good company. 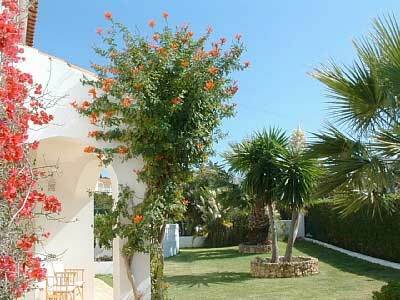 A wrought iron gate leads from the lawn to the pool and the extensive sun terrace. The large pool has supplementary heating from a bank of solar panels and a thermal cover to keep the heat in. This combination generally means the water temperature is around 5 degrees centigrade warmer than pools with no heating other than direct sunshine. The pool and terrace can be lit at night to the delight of both children and adults alike. At one end of the main pool is a separate shallow pool, ideal for toddlers or indeed for anyone who prefers to relax with a good book and a drink in the warmer shallow water. The large pool terrace has plenty of space for sun bathing, dining and socialising, and with the convenience of the pool terrace BBQ, it is the perfect setting for long lazy lunches or evening feasts. A dozen sun loungers plus further tables and chairs make the pool terrace a place many choose to spend most days of their holiday. Beyond the pool terrace and alongside the tennis court is a tropical garden of palm, cacti and fruit trees. The garden has a beautiful pond with a variety of fish and frogs, and a covered terrace with a few chairs and a hammock to relax in, and read a good book.